The term ‘iCloud Storage Family Sharing’ was derived from ‘Family Sharing with Apple’. Apple’s Official definition of Family Sharing reads thus “Family Sharing makes it easy for up to six family members to share iTunes, iBooks, and App Store purchases, an Apple Music Family Membership, and an iCloud storage plan. Therefore, iCloud Storage Family Sharing is an integral sub-part of Apple Family Sharing. But it’s about sharing Apples’ iCloud storage plan with your family members. 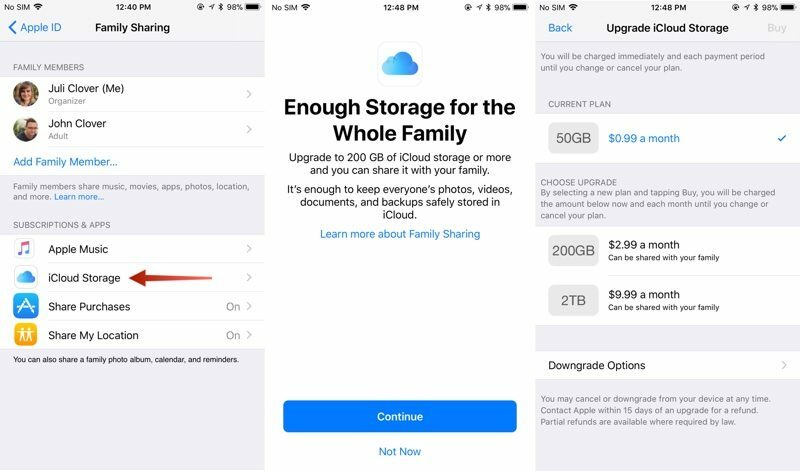 Do you know that you can add up to five of your family members to your single iCloud storage plan via iCloud Storage Family Sharing? This would benefit your family members by making sure they all have enough iCloud storage for the media files such as photos, videos, documents and iCloud backups. With 200GB or @TB storage plan, you can give every member of your family a substantial storage space for all their storage needs. You don’t have to worry about your privacy because your photos and documents stay private and can only be accessed by you just as you have in your own storage plan with iCloud. Here are some tips on how to get the best out of iCloud Storage Family Sharing. Step 1: Click Settings app on your iPhone. Step 2: Click Set Up Family Sharing > Get Started. Step 3: Choose iCloud Storage as the first feature to share with your family members. Step 4: When you see the prompt, use messages to invite five members of your family to join your Family Plan. Your invited family members will see your invitation, accept or reject it. 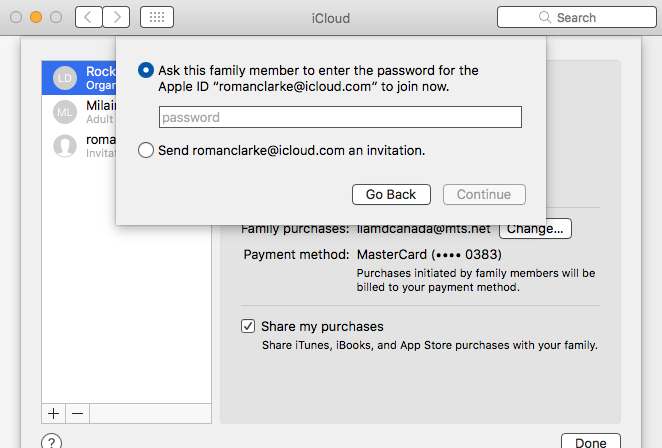 They can also keep their paid iCloud accounts if they want to while joining your family membership plan. If you’re still on the free 5GB free iCloud storage, you are not eligible to create a Family Sharing. You’ll need to upgrade your free account to a 200GB or 2TB storage plan. Step 1: Click Settings app on your iPhone, iPad or iPod touch. Step 2: Click Your Name > iCloud > Manage Storage or iCloud Storage. Step 3: Click Buy More Storage or Change Storage Plan. Step 4: Select a plan, and click Buy. You should follow the onscreen instruction to complete the payment process. Step 1: Click Settings > Your Name > Family Sharing > iCloud Storage. Step 2: Upgrade to a 200GB or 2TB plan. Step 3: Send a message to family members with existing paid storage plan for them to know that they can now switch to shared storage plan. It is easier to unite your family under one common iCloud storage plan with apple sharing. This would help you to know what amount of storage the family is using and the best way to increase it when the need arises. Step 1: Click Settings on your iPhone, iPad or iPod touch. Step 2: Click Family Sharing. Step 3: Click iCloud Storage. 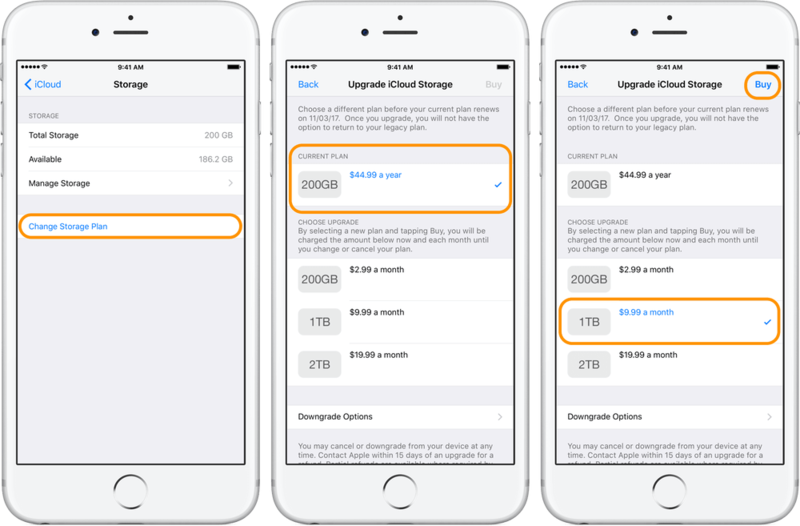 After these steps, a notification will be sent to your family members if the iCloud storage is low. Then the family organizer can proceed to buy more storage space for the family. iMyFone TunesMate is a PC based iOS transfer tool that helps users to freely transfer media files between iPhone, iPad, iPod touch and computer/iTunes. If you want to share files with your family members without using iCloud Family Sharing, then TunesMate can be very handy in sharing your files with all your family members. Share files without iCloud and iTunes, give you the freedom to send and receive files without iTunes error or iCloud restrictions. Share iTunes/iPhone music with family or friends, even to family and friend with different Apple IDs. Share lots of files and there is no limitation to the number of files you can share. Share any type of files between iTunes, iPhone, and computer. All types of iOS files such as music, playlist, photos, videos, etc. are allowed for sharing. Merge files from different iTunes and Apple devices. Fully compatible with iOS 11 and iPhone X/8/7/7s/6/6s/SE/5/5s…. Sharing files between your family members using TunesMate takes two procedures: Transfer iPhone music to computer, and transfer computer music to iPhone. Step 1: Open your computer and connect your iPhone using a USB cable. Launch TunesMate and click “Music” tab. 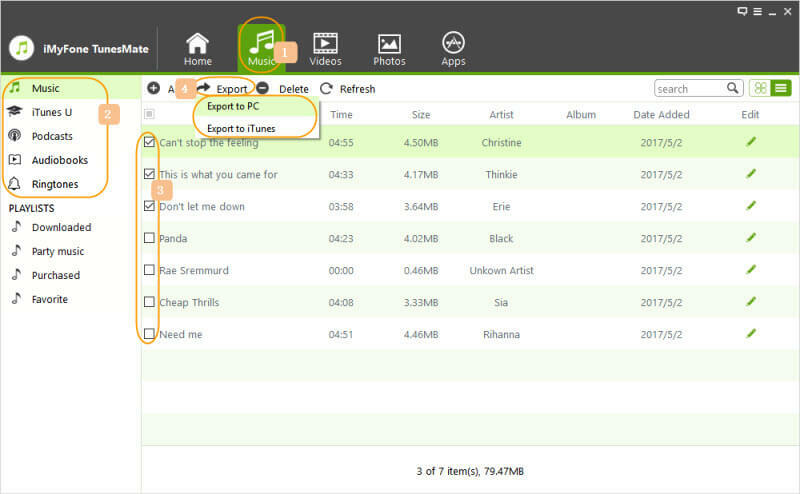 Step 2: Tick the songs you would like to export to your PC, then click Export > Export to PC. 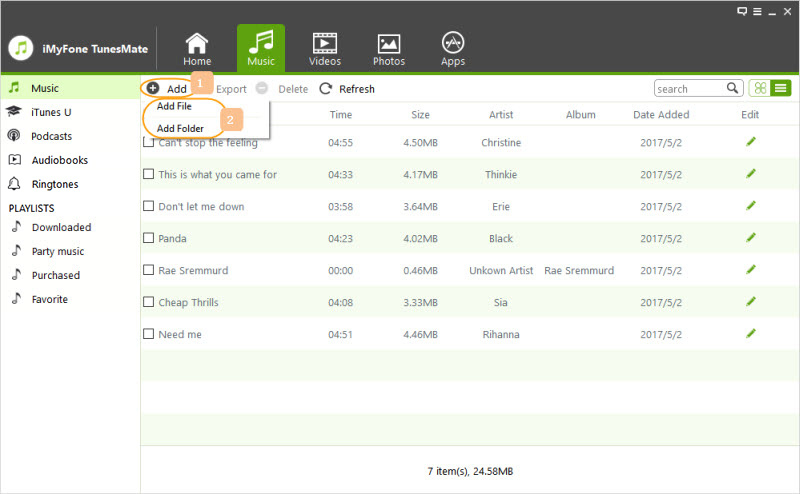 Step 3: Browse and select the target folder, then click “Select Folder” to export the music. Click “Open Folder” to find the exported songs. Step 1: Open your computer and connect your family member’s iPhone using a USB cable. 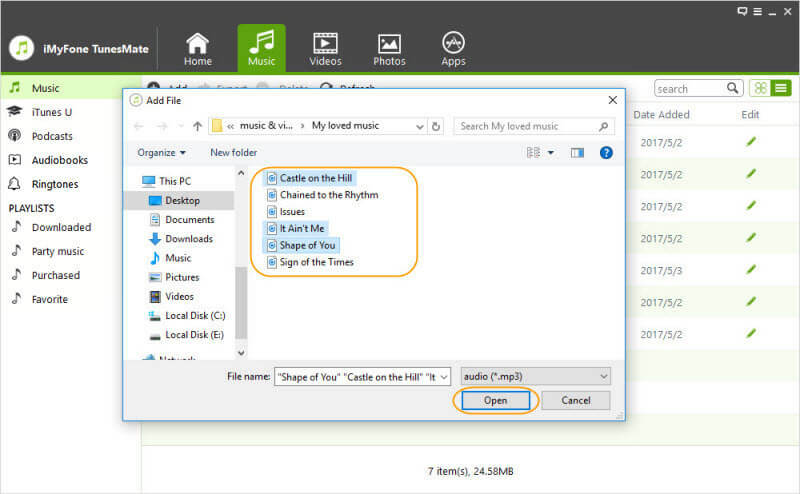 Launch TunesMate and click Music > Add > Add Files/Folder. 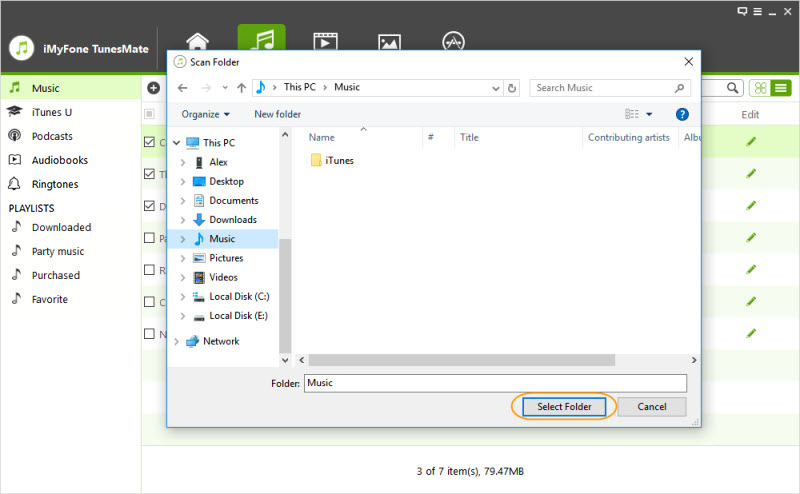 Step 2: Choose Add Folder, and locate your music folder on your computer. Step 3: Select the songs and click Open to transfer the selected songs to your family member’s iPhone.